The American form of the game is also referred to as gridiron football and is as much a game of gaining and controlling territory as it is of scoring points. It is a game of inches played on a field measured in yards. 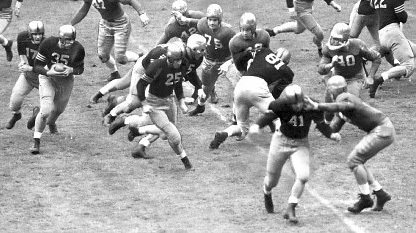 Each team defends the field behind its line and tries to invade the other's territory until they are in a position to score a touchdown or a field goal. As such, American football is a form of ritualized combat, but it differs from combat sports like boxing, fencing, or wrestling in that the battles are won or lost by a team rather than an individual, and just like an army, each soldier or player has a job to fulfill on the road to victory or defeat. If it all seems complicated, well, it is if you have not grown up watching or playing the game. This is part of what makes football such a great topic for Old Time Radio. Another reason is the sense of ritual which surrounds the game. Football season is in the autumn, traditionally after the harvest has come in. The most exciting games are not necessarily those for the season championship, but the games between rival schools. It gets to the point that a school’s reputation is judged more by the football team’s prowess on the gridiron than the academic success of its alumni. It is hard to express the athletic grace and power of even a star football player on the radio, but we can see the reactions of those around them. Fans may swoon in such a godly presence while rivals may stoop to almost melodramatic measures to keep the hero from performing in the big game. Whether you are a fan or not, there is plenty of drama in our Football Collection for fans of football and Old Time Radio. This collection is also part of the Sports Broadcast Collection (Vol. 3). Be the first to comment on "Football Recordings"